Graduation season is here, and with that comes graduation parties! We at Pear Tree love to see all the great graduation party ideas that our customers come up with. You guys are all so creative! This is an important celebration not only for your grad, but for you as a parent. It’s been a journey for both of you, and that’s absolutely worth celebrating! But throwing a party can be daunting, especially one that will make both kids and adults happy. The best place to start is with your grad. What are his interests? How can you use her personality to come up with a party theme? 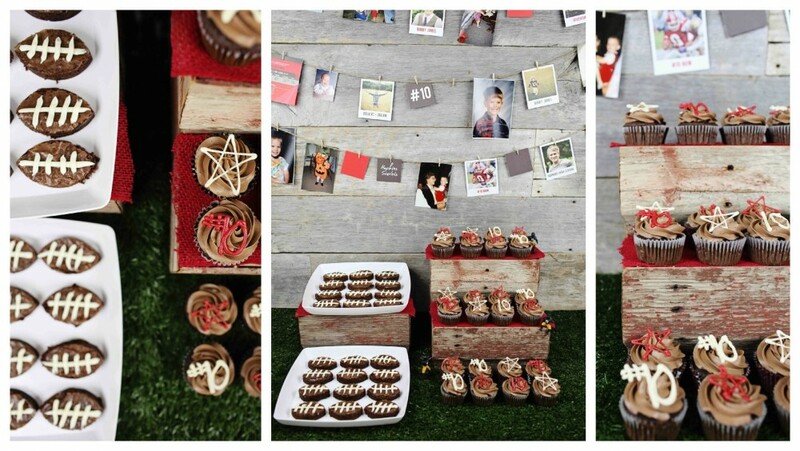 Here are a few easy ways to incorporate your grad’s story into your graduation party ideas. We’ve chosen a sports theme, but the same design elements can work for any theme. 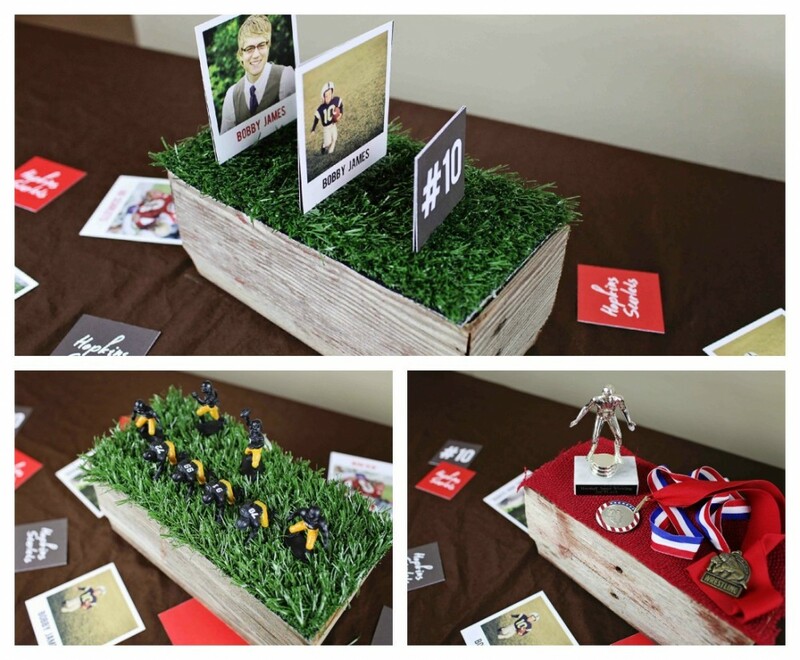 For many graduates, sports are a very important part of their journey through high school, so it’s a natural idea for a graduation party. 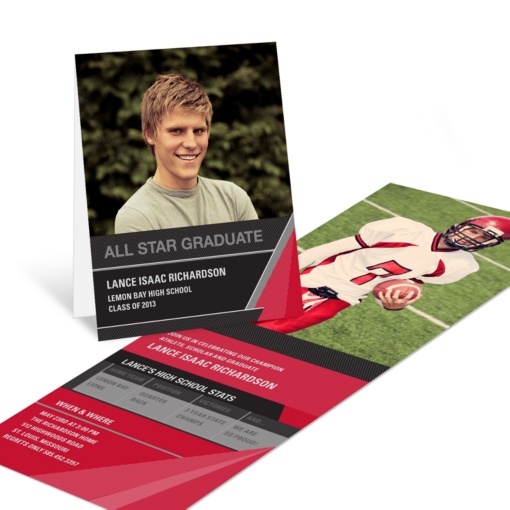 We have the perfect All Star Graduation Invitations to honor the athletes in your life. They even allow for a few stats highlighting their (or their team’s) athletic achievements. Every graduation party revolves around the food—what great party doesn’t? Considering there might be a lot of hungry athletes in attendance, in addition to other friends and family, you’ll want something easy. Walking tacos are both easy and a favorite with teens. A kitchen or bar area in a basement works well for your serving area, because the sink can double as a beverage center and sets a little more casual tone for the party. 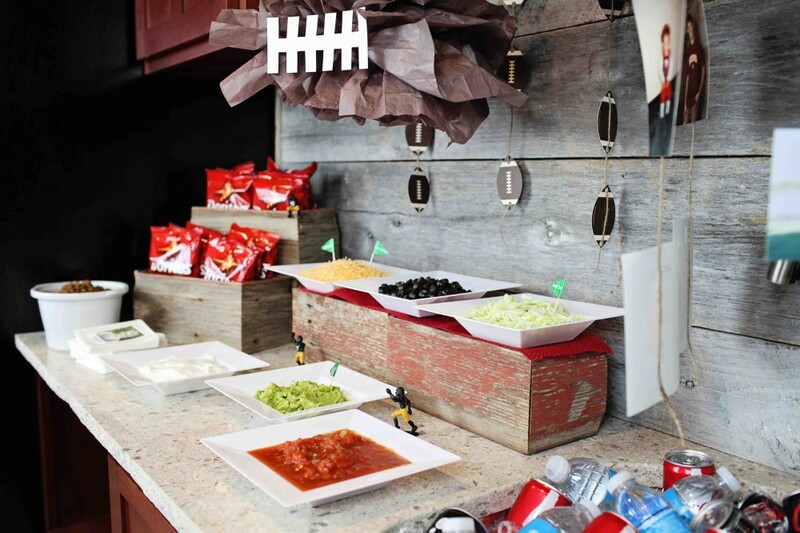 For extra little touches, you can make a football shaped tissue pom, football garland created from our party gift tags, and personalized graduation napkins. Everyone will love the little details. One of the most unique things about every graduation party is the special way each family finds to honor their grad with photos and memories of their journey. We have some great ideas on graduation photo displays, and for this party we used a combination of childhood photos and our new personalized graduation party decorations. These new party decoration pieces are SO versatile! For our party, we personalized them with photos, our grad’s name, jersey number and college plans. We then strung them, along with the childhood photos, onto a barnwood wall using mini clothespins. They can also be laid down on the table (which you’ll see down below), poked into centerpieces, cupcake toppers, and so many other ways. We love this new product! What’s for dessert? We all agree, desserts should be pretty non-stress. A good cookie, brownie, cupcake or cake, and you really can’t go wrong. We cut out football shaped brownies and quickly drew on some football laces with frosting. We also made some delicious little cupcakes that featured the graduate’s number from high school as a topper along with stars…because they’re the star of the party! Having some sort of guestbook isn’t a must-have at a graduation party, but it’s fun to have friends sign something as a memento that the grad can keep. 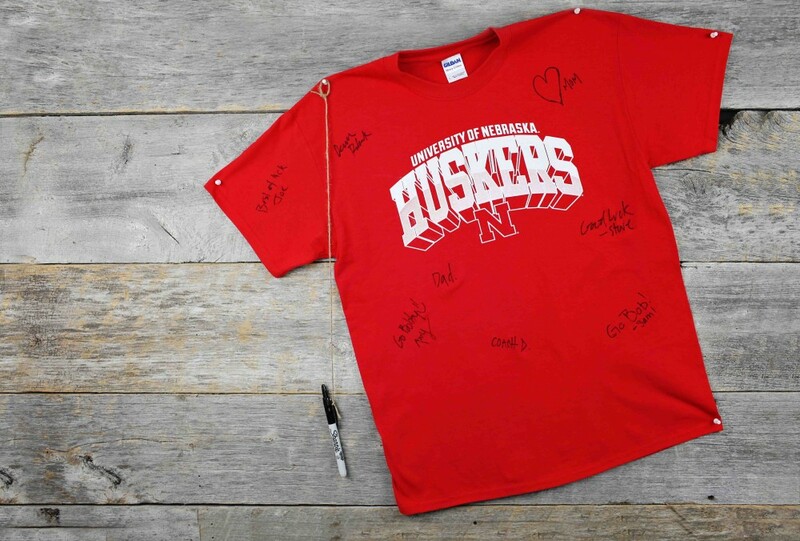 We wanted to do something creative for this party, so we chose a t-shirt from his future college and had everyone sign it. Lastly, the table centerpieces. You want to give guests something to chat about while sitting and eating and what better to do that than photos and mementos from the graduate’s past. We used the new graduation party decorations not only as table décor but also incorporated them into one of the centerpieces. Oh, and we found the green turf online—we thought it fit perfectly into this graduate’s high school passions and future plans! Look for more graduation party ideas on our blog, or browse through our graduation invitations and party decoration to spark ideas. We’d love to see any great ideas for graduation party ideas that you have! Thanks for the great ideas. My ‘baby’ will be graduating in May. While he doesn’t like sports, I loved the guest book college t-shirt idea. I intend to “borrow” it. That’s great, Barbara! We love the college t-shirt idea, too. And remember, you can make the graduation party theme around any interests your grad may have – this is one example :). Congrats to your family and your son on this exciting accomplishment! Where do you find the mini clothes pins? Pingback: Easy Graduation Party Ideas for You! when selecting 1 for the room.